Beaded bracelets are great fun to make and to wear. As far as beaded jewelry goes, bracelets are great because they are an "easy" accessory—just slap one on with your favorite t-shirt, sweater or shirt. Most easy beaded bracelet patterns can be stitched up in an evening or a weekend, and you can make them as casual or as dressy as you want! Try designing your very own beaded bracelets with a few of these easy ideas. One easy way to make a knockout bracelet is to take a single stitch— like right angle weave—and work it using crystals or fancy glass beads. 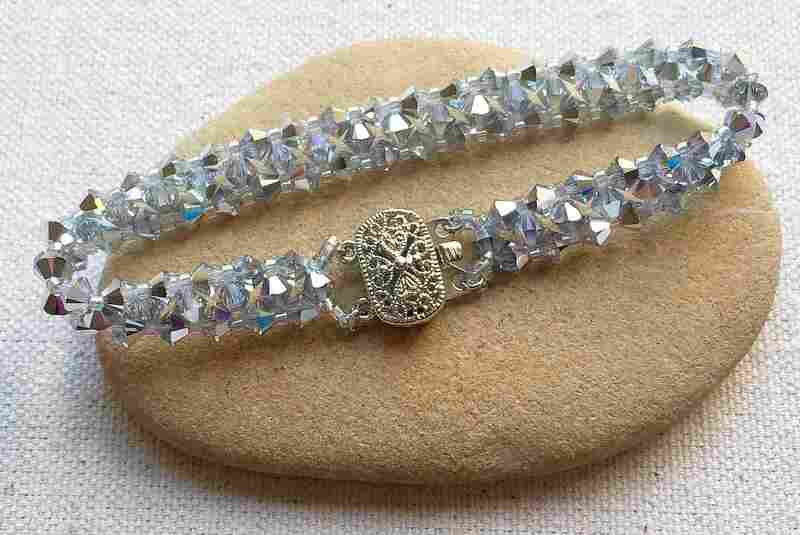 You can make a sparkling tennis bracelet in an evening using some crystal bicones and seed beads. For something a little bolder, make a base of open-weave squares using single needle right angle weave and embellish the open squares with different glass or crystal beads, or use pearls and tiny seed beads. Right angle weave lends itself to dozens of great ideas for making easy beaded bracelets! Making a flat peyote stitch bracelet is a great way to master both even count and odd count flat peyote stitch. Using a larger size seed bead such as a size 8 Delica or a size 6 Japanese seed bead will make it easier for you to see where you are stitching and make the bracelet quicker. Add a decorative trim using smaller size 11 seed beads, and you will have a unique creation all your own! Once you are more familiar with flat peyote stitch, you can add some texture to your bracelet by including shaped beads like triangle beads, drop beads and peanut shaped beads. Or skip the seed beads entirely and use cube-shaped beads. You can also experiment with increasing peyote stitch to make a ruffled edge bracelet. For more unique embellishments, try stitching on some antique buttons or use a button and bead loop for your clasp. Flat herringbone stitch is a beautiful stitch to use for a wide beaded cuff bracelet. Because the beads lie at a slight angle to each other, using a shaped seed bead like a cube, drop or lentil bead will give you an explosion of color and texture. Tubular herringbone stitch makes a substantially textured rope. You can vary the look considerably by the size, types, and colors of beads. Twisted tubular herringbone takes a little longer to do than a flat stitch, but makes a slim and elegant textured rope for a bracelet. Attach your favorite clasp for an easy bracelet, or attach a set of your favorite themed charms for a more personal statement like in the beachcomber twisted herringbone bracelet. Beaded chains work just as well for bracelets as they do for amulet bag and pendant straps. A single row of a stitch like St. Petersburg stitch will look wonderful worked up with bugle beads and drop beads for some color and texture. Or try a double version of St. Petersburg Chain and use a small (3 mm or 4 mm) gemstone bead as your center bead. For beginners or younger beaders, a simple bracelet made with daisy chain is always a favorite and something that can be worn every day! And don't limit yourself to just one. A stack of daisy chain bracelets is as bright and cheerful as a garden. Beaded ropes are great for beaded necklaces, but for some people, they just take too long! Making a bracelet out of a beaded rope is a much easier option. Spiral stitch is one of the easiest spiral rope patterns and also one of the quickest to stitch. Once you've mastered spiral stitch, give double spiral stitch a try. It is only slightly more complicated, but the results are sure to bring compliments. Be sure to experiment with different kinds of shaped beads to turn a plain beaded rope into something with lots of pizazz. Beaded netting works up fast, so you can make a bracelet in a relatively short amount of time. The sand and sea horizontal netting bracelet pattern are challenging at first, but the pattern repeats every 9 rows, so you'll get the hang of it quickly. Chevron stitch, also called zig-zag chain, is a variation of netting that makes a great bracelet. You can also use tubular netting to make a netted tube bead to slide on a chain bracelet or to cover a bangle from a craft store. If you can't find a plain bangle bracelet, use a length of flexible plastic tubing and finish it with a set of bead caps and your favorite clasp. Beaded fringe isn't something you normally think of for a bracelet, but it is a great way to embellish a single bead strand or simple beadwork band. It works for the center or sides, just make sure the fringe isn't too long or it may get caught and break. To start a basic fringe bracelet, string a single strand of large seed beads (size 8 or 6), and fasten a clasp to either end. Then start a new thread at one end of the strand and work as many lengths of fringe as you want until you reach the other end! It's a great way to use up leftover beads and you can make it as thick and fringe-y as you want.